LESSON DEMONSTRATES HOW TO BUILD ONLY. You can choose to glaze/underglaze/paint how you choose to teach it depending on the resources available to you. Get more ✂ARTASTIC✎ Spring products! -Either project the step-by-step pages from the PDF for your students to follow, or use it as a guideline for yourself so you can demonstrate the art project to your students. 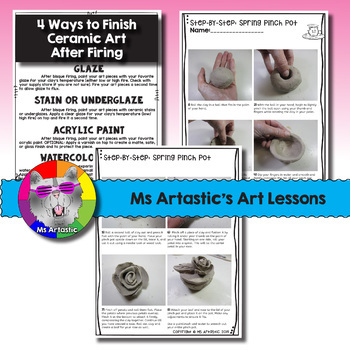 -Look over the lesson plan for the materials needed for your art project. Gather these in advance! Then there will be no panic during the lesson. -Photocopy any necessary student handouts such as step-by-steps or rubrics. These will be needed during your art lesson and are very helpful for students. -Look over the lesson plan to see what to do and what materials are needed. 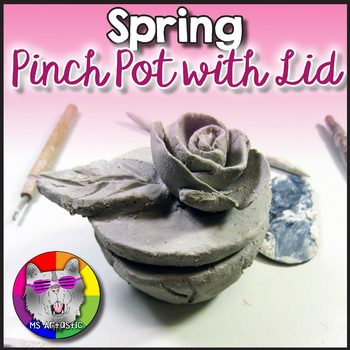 -Look over the visual and text step-by-steps to see how to make the piece and possibly you may want to make a sample yourself so you have no problems helping your students later. -Show the PDF over your digital projector, under a document camera (best if you have it printed in color) or use as information for yourself as you demonstrate the art lesson to your class. -All steps include both a visual and text description to make teaching this or showing this directly to your students and easy process and will eliminate any confusion! -Example of Art Piece to show your students before they create! For clip art, you may use them as clip art, website graphics, binder covers, or even bulletin board decorations. By additional licensing for school use. Share this product with other teachers, administration or districts. Admin can buy additional licensing. Sell this product or give it out for free or photocopy it for others.